There’s a Growing Movement to Let 16-Year-Olds Vote. It Would Change Everything. In the wake of Parkland, many are asking for a lower voting age. Of course, in a country where the voting age is 18, most of these high school activists can’t actually practice what they preach. 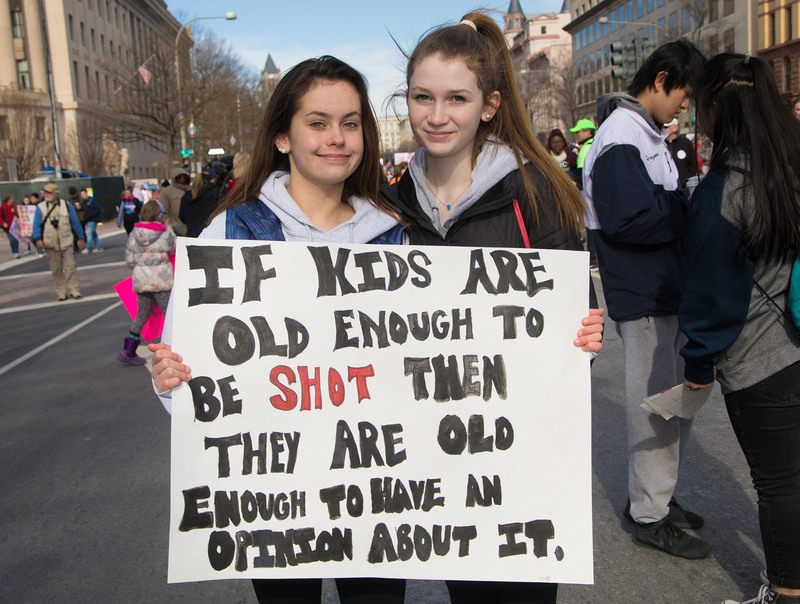 But the nationwide demonstrations added fuel to a conversation sparked last month when Stoneman Douglas students took their lawmakers to task on CNN—a growing number of commentators are now calling for the voting age to be lowered to 16. It’s not a wholly new idea; activists have been fighting for this change for years. In a few cities, they’ve succeeded—at least when it comes to local elections. Even some prominent lawmakers, such as House Minority Leader Nancy Pelosi (D-Calif.), have supported it. To advocates, lowering the voting age is not simply a matter of rewarding the political enthusiasm shown by students. Research suggests that voting in high school might actually help lead to greater lifelong civic engagement. Scholars, moreover, argue that the teen brain is prepared to make complex political judgements. And while the movement faces strong detractors and procedural hurdles, proponents hope it could find new resonance after Parkland. 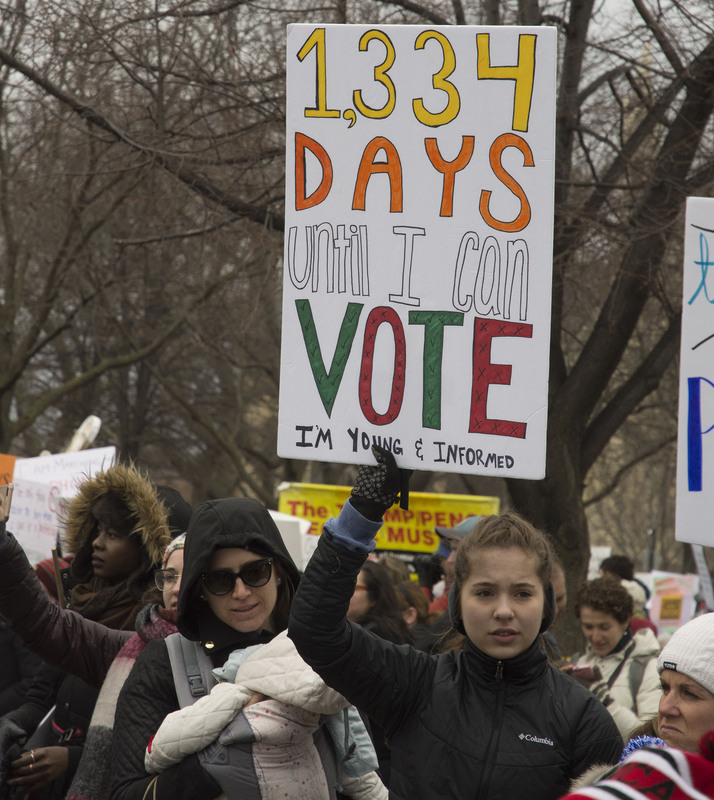 A young protester at the March for Our Lives rally in Chicago counts down the days until she can vote. America’s original voting age, 21, was set in a somewhat arbitrary fashion, according to Joshua Douglas, a law professor at the University of Kentucky. That had been the age under British common law, and the Founders simply followed their colonizer’s lead. The age didn’t change until the Vietnam War era, when young people reasoned that those who were old enough to be drafted into the military should have a say in choosing the lawmakers and political leaders who sent them to war. In 1971, their push led to the 26th Amendment, which guaranteed anyone 18 years old or older the right to vote. Twenty countries have granted 16- and 17-year-olds the right to vote. A handful of American cities have done the same for local elections. They can do this because states generally regulate their own voting laws, as do cities that are governed by their own charters. The 26th Amendment states only that 18 is the minimum age at which voting rights must be protected; it doesn’t prohibit cities and states from making it even lower. In 2013, Takoma Park, Maryland, became the first US city to lower the voting age for local elections to 16, and early data points suggest that the experiment has been successful. In an off-year local election that would normally yield a low voter turnout, 17 percent of the city’s voting-eligible 16- and 17-year-olds cast ballots. That might sound low, but it was was double the 8.5-percent turnout of those 18 and up. Since then, nearby Hyattsville, Maryland, has followed suit. People 16 and up can now vote in local school board elections in Berkeley, California, as well. The promising rates of participation echo research conducted into voter pre-registration initiatives, which enable 16- and 17-year-olds in some states to register to vote in anticipation of becoming 18 before an election. A 2017 study found that turnout among young voters is as much as 13-percent higher in states with pre-registration systems, and that the bump applied fairly uniformly to voters representing all demographics and political ideologies. The correlation, says Michael McDonald, a political science professor at the University of Florida who has done research on pre-registration initiatives, may have something to do with the fact that these programs typically occur within schools. Teenagers generally attend high school, after all, and for those who don’t go off to college, it might be the last time they can easily connect with local civic engagement opportunities—especially in light of declining membership in institutions such as churches and unions. “You were capturing some of the young people who didn’t go off to [college] and who stayed in their communities, they were continuing to be politically engaged,” McDonald says of the pre-registration efforts he studied in Florida and Hawaii, the first states to enact such initiatives. High school also offers a last shot at robust civic education, which McDonald and others say is key to lifelong voting. Peter Levine, the former director of the Center for Information and Research on Civic Learning and Engagement, a research organization that focuses on youth democratic participation, also points to the fact that high school may be one of the best times to establish civic habits like voting—before the disorienting transition into early adulthood begins. “People are still in their context where they grew up, so they can make a transition to voting more easily,” he says. “Eighteen is arguably a really bad year to start because that’s when everybody’s lives are [being] disrupted.” That’s important, since one of the best predictors of whether someone will vote in an election is whether they did in the last one. In short: If someone doesn’t vote in their first election, it’s less likely they’ll build the lifelong routine. So what if the city of Parkland wanted to reward its woke teens with the right to vote in local elections? Since Parkland is a charter city, that would be simple enough, says Brandon Klugman, a campaign representative with Vote16USA, which supports grassroots efforts to lower the voting age. As in Takoma Park, Parkland’s city commission would likely just need to pass a charter amendment to make the change. Otherwise, activists would need to press for a change at the state level, an effort already underway in California and New York, where lawmakers have introduced state constitutional amendments to lower the voting age to 17. Conservatives likely aren’t wrong about the political implications of younger people voting. While there’s obviously no data on the 16- and 17-year-olds’ voting patterns, millennial voters certainly lean further left than older generations and tended to support liberal candidates in the 2016 election. Any worries about legal complexities might be premature at this stage—state bills that would grant 17-year-olds voting rights in federal elections have languished since their introduction. And for the time being, Vote16USA’s ongoing advocacy efforts in Massachusetts, Virginia, Colorado, and cities across California have focused on allowing teens to vote in school board races and other municipal contests, and on building a broad base of support before tackling bigger projects.